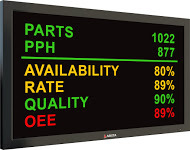 The repair and maintenance costs of a large format LCD display computer in a high ceiling installation can be very expensive. Having a swappable CPU module in a Large Format Display Computer can minimize downtime, maintenance and repair costs. With a swappable CPU module, replacing the CPU module is quick and easy, does not require taking down the unit, saving a great deal of manpower and cost. Arista Corporation’s ARP-5565BP-E01, a 65” large format LCD display ACP Enabled Thin Client with a swappable CPU module, was specifically designed for applications like marquees, process control boards and overhead KPI displays. Provides an enormous amount of flexibility. The ARP-5565BP-E01 has been designed to seamlessly integrate a 65″ large format LCD display and ACP Enabled Thin Client with ThinManager® offering centralized management solutions for the modern factory and office — simplifying the management of applications and visual sources. The combination of a swappable CPU module and auxiliary video input creates the functionality of a dual display backup setup. In a dual display setup, two large format display computers are inter-connected. The VGA output of each CPU module connects to the VGA input of the other unit. In the event of CPU module failure, the technician can power on the other CPU module meaning the dual displays will be back working once again. In a dual display setup, one unit functions as the primary display and the other unit functions as the secondary display. In the event of a CPU module failure, the secondary display becomes the primary display. The secondary dual display backup continues to operate until the failed CPU module is replaced.